Why does Radiohead matter?, Why or How is it that after 20+ years they still find a way to innovate and create something new?, Are they still relevant?, Do they win new fans with their album release?, What does their marketing mean to all the rest of the bands out there? Is this their best album yet?, Did they innovate?, Did they create something new? After 9 albums and multiple different solo ventures, who are they? All of these questions, and more, came up to me while listening to their new album. Is it their best album?, I don’t know. Is it a return to form?, I don’t even know what that means. I don’t know if I want them back in whatever their old form means. This is what I do know, this album felt right. This album was what I needed and wanted to hear, I didn’t know this until the album started playing before my ears. Granted, the first time I heard the first single “Burn The Witch” it did not do much to impress, however after listening to the second single, in which they gave a chance to the up and coming filmmaker known as Paul Tomas Anderson to direct it, the first single felt better in my ears. Then the album happened, and song after song it was just what needed to be played. Yes, in my not so humble opinion it does sound like a Jonny Greenwood album. It also sounds like a soundtrack to a PTA film, one that has yet to be filmed. It sounds beautiful and grand, no, it is not reinventing the wheel. No, it is not visionary, yes, it was amazingly produced. Yes, it’s quite possible it’s in my top 2 albums from the band. All 11 tracks in this album are beautiful and magical. They sound great in the record and I can only imagine that they will sound majestic live. “Ful Stop” is a favorite, so is “Desert Island Disk”, and also “The Numbers” as is “Present Tense”. At this point you can get the idea that the whole album is absolutely worth a listen, if you like music. And if your were one of the lucky bastards to score tickets to one of their shows at non-festivals then I’m sure you will be in for a treat. To those that say that this sounds somewhat emo. That it sounds sad. That it is too slow. That is too downtempo. That they prefer dancing Thom. That hey prefer when ______… Listen, just please stfu. It’s ok not to like it. The same way that it’s ok to like it. The one thing anyone can say is that whenever Radiohead releases an album, you can be sure that everyone will have an opinion. As biased as it will be, everyone will have one. 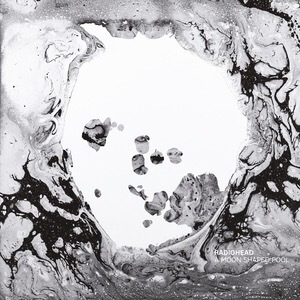 All hail Radiohead, Nigel Godrich and Stanley Donwood included!, For they’re one of the last visionaries recording.